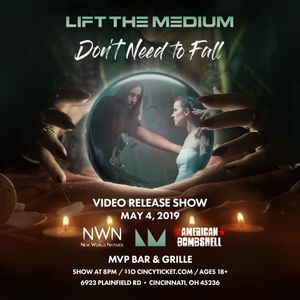 Join us for this special Moment In Time as we debut our new music video and rock the Never On Sunday stage at MVP! We have a great production in store for everyone, including performances by Dayton's New World Natives and Indy's American Bombshell. Tickets are $10 or enjoy the VIP experience at 6:30 for $40 which includes an exclusive video viewing and Q&A with the band before the show, appetizers by Bartone Catering, a special edition t-shirt and admission (VIPs limited to 30 people). Join the event and stay tuned for more details and tickets as we go all out to celebrate this major release!